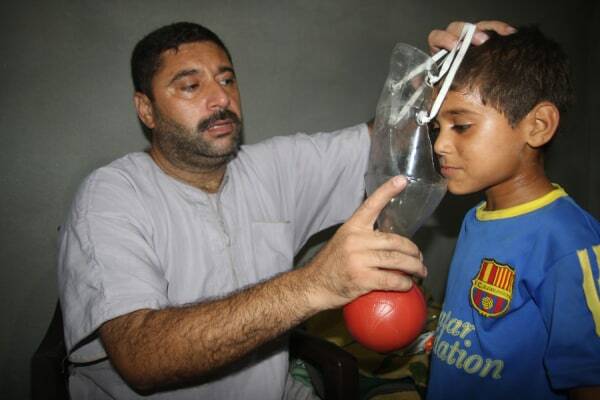 Gaza resident Nafez Nayef is making homemade gas masks for his family and friends, worried that a US strike on Syria will prompt the Assad regime to hit back at Israel with chemical weapons. GAZA CITY, Gaza Strip — When Gaza resident Nafez Nayef first heard that the United States might attack Syria — which Gazans fear will prompt a retaliatory chemical attack against neighboring Israel — he says he knew he had to get gas masks for his family right away. But because both Israel and Egypt limit the goods that enter the Gaza Strip, a small, isolated territory on the Mediterranean, only a handful of journalists and riot police has been able to obtain masks. So Nayef took to YouTube to figure out how to make them — convinced it was better than nothing if Syrian rockets landed near or in Gazan territory. There was one YouTube video he preferred: a three-minute tutorial uploaded by an al Qaeda fighter in Iraq. “All you need is an empty, 2 liter soda bottle, paper towels, vinegar, a plastic jar and ground coal,” Nayef said. He uses the jar as the filter, stuffing it with paper towels soaked in vinegar to absorb the gas. Opening the body of the soda bottle, he attaches it to the jar to cover the face. Already isolated and struggling economically, Gaza was hit even harder when Egypt’s military ousted former president and Muslim Brotherhood leader, Mohamed Morsi, in July. The government that replaced Morsi partly blamed Palestinians and the Islamist Hamas movement, which controls the Gaza Strip, for some of the violence that had gripped the country. In addition to shutting its passenger crossing with Gaza, the Egyptian military moved to close the tunnels that ferry goods under the Gaza-Egypt border. Gaza’s Hamas-run government says Egypt has destroyed more than 90 percent of the tunnels, which are used to smuggle fuel, construction materials and other goods to the territory’s 1.7 million residents. The head of Gaza’s chamber of commerce, Maher Attabar, says Gazans are finding it nearly impossible to buy Israeli goods — at nearly double the price. Construction on new homes and buildings — which was booming in 2011 and 2012 — is now completely stalled as materials from Egypt are blocked. In Gaza City, residents wait for hours in long lines at gas stations for expensive Israeli fuel. Without allies, an ailing economy and acute shortages, Gazans say they feel stranded in the region. Now the specter of war — after the U.S. threatened Syria with military strikes in the wake of a chemical weapons attack in the Damascus suburbs Aug. 21 — is making Palestinians here feel even more vulnerable. “The unrest in Egypt has affected us badly, the problems between Hamas and Israel have made our lives unbearable. And the conflict in Syria may also affect us if the US attacks Damascus,” he said. The likelihood of a U.S. attack on Syria decreased in recent days, when the U.S. and Russia announced talks to put Syria’s chemical weapons under international control. The U.S. had moved several naval destroyers into the Eastern Mediterranean over the past couple of weeks to ready for a strike, which President Barack Obama said would be aimed at deterring Assad from using chemical weapons. The United Nations says more than 100,000 people have been killed so far in the two-year-long Syrian conflict, pitting the regime of Syrian President Bashar Assad against a largely Sunni Muslim opposition. Hundreds died in the Aug. 21 poison gas attack on rebel-held neighborhoods outside Damascus, which the U.S., Human Rights Watch and other Western countries say was carried out by Assad’s forces. “We are affected by everything happening in the region,” said Mazen Maarouf, a vegetable seller from Beit Lahiya, in north Gaza. Nayef remembers when in 1991, Iraqi dictator Saddam Hussein fired ballistic missiles at Israel after the U.S. and other troops pushed back an Iraqi invasion of Kuwait. He also threatened to hit Israel with chemical weapons, prompting Gazans to seal their windows with plastic sheets, Nayef says. This time, Nayef, a former policeman, is doing the same — and also making masks for his friends and other relatives. Nayef’s brother, 35-year-old Nael, says he is less worried about a chemical attack from Syria that eventually reaches Gaza. He says it’s more likely that Palestinian militant groups like Islamic Jihad — which have strong ties to Syria’s main patron, Iran — would fire rockets at Israel to avenge a U.S. strike against Assad. Israel could respond to the rockets by launching another offensive on Gaza. And Nael says he is worried Israel could use white phosphorus on Gaza like it did in the 2008-2009 war here, Operation Cast Lead. White phosphorus is used in incendiary munitions and produces an instant blanket of smoke. International law prohibits its use on civilian areas. At Nayef’s house, he is preparing for chemical war, but there are also more pressing concerns. Right now, Gaza’s power is out for roughly 12 hours each day — and Nayef has eight children to take care of. “I can barely get fuel for my generator,” he said. Yitzhak Rabin, Bill Clinton and Yasser Arafat on 13 September 1993. Abu Jamal is the mukhtar, or elected leader, of the Abu Taima family, 3,500 refugees fromBir al-Saba — a town in present-day Israel called Beersheva — now scattered among the farmlands outside Khan Younis. Iraqi women and children gather outside of a Sunni mosque after a suicide bomber struck during Friday prayers in the village of Umm al-Adham in Diyala province, a former militant stronghold 60 kilometers (35 miles) northeast of Baghdad, Iraq, Friday, Sept. 13, 2013. Iraq is weathering it deadliest bout of violence in half a decade, raising fears the country is returning to the widespread killing that pushed it to the brink of civil war following the 2003 U.S.-led invasion. BAGHDAD (AP) — A bomb hidden inside an air conditioner exploded Friday at a Sunni mosque packed with worshippers northeast of Baghdad, the deadliest in a series of attacks in Iraq that killed 33 people, officials said. The blast in the village of Umm al-Adham on the outskirts of Baqouba, a former insurgent stronghold, left the green and white walls of the mosque spattered with blood. Debris was strewn across the tiled floor. Police said at least 30 people were killed and 45 wounded. Two security officials said the bomb was hidden inside an air conditioner unit placed in the window. Baqouba, 60 kilometers (35 miles) northeast of Baghdad, also was hit with deadly violence earlier this week. Three car bombs targeting outdoor markets Tuesday killed at least 10 civilians in the city. A roadside bomb also killed two soldiers and wounded two others in the northern city of Mosul, while gunmen shot and killed Khalaf Hameed, a local municipal official in the nearby Shora district, authorities said. Hospital officials confirmed the causality figures for all the attacks. All officials spoke on condition of anonymity because they were not authorized to talk to the media. Iraq is weathering its deadliest bout of violence in half a decade, raising fears the country is returning to the sectarian bloodshed that pushed it to the brink of civil war in the years after the U.S.-led invasion that ousted Saddam Hussein. The months-long surge of bloodshed is taking place against the backdrop of rising tensions between Iraq’s Sunni and Shiite Muslims. The tensions are being inflamed in part by the sectarian divisions reflected in the civil war in neighboring Syria. Members of Iraq’s Sunni Arab minority have been protesting against the Shiite-led government since December, angered over what they see as second-class treatment of their sect and what they see as unfair application of tough anti-terrorism measures. Attacks surged after a deadly crackdown on a Sunni protest camp by security forces in April. There was no immediate claim of responsibility for Friday’s attacks. Al-Qaida’s local branch, known as the Islamic State of Iraq and the Levant, and other Sunni extremists have tried to harness the anger of many Sunnis, even as more moderate members of the sect appeal for calm. Al-Qaida has claimed responsibility for a number of large-scale bombings in recent months and is believed to be behind other coordinated attacks. It frequently targets Shiite civilians, members of the security forces and those seen to be closely tied to the country’s Shiite-led government. There has also been a spike in attacks on Sunni mosques in recent months. While it is possible that Sunni extremists could be to blame, Shiite militias that had been largely quiet for years may also be behind those assaults. More than 4,000 people have been killed in violent attacks since the start of April, including 804 just in August, according to United Nations figures. Also on Friday, al-Qaida in Iraq claimed responsibly for a failed assassination attempt that took place early this month against a prominent Sunni militia leader opposed to al-Qaida, according to a statement posted on a militant website. Al-Qaida said that three suicide bombers tried to storm the house of Wisam al-Hardan in Baghdad after attacking all the checkpoints leading to his residence. Al-Hardan was recently appointed by the Iraqi prime minister to lead the anti-Al-Qaida Sunni militia known as Sahwa. The Sunni leader was not hurt in the attack that killed seven people, including six of his bodyguards. Sahwa fighters joined U.S. troops in the war against al-Qaida at the height of Iraq war. Ever since, it has been a target for Sunni insurgents who consider them traitors. A Rohingya Muslim illegal immigrant from Myanmar cries as he prays at the Immigration Detention Centre during the Muslim holy fasting month of Ramadan in Thailand’s Kanchanaburi province July 10, 2013. BANGKOK (Thomson Reuters Foundation) – Some 250 Rohingya Muslim men who fled Myanmar by sea and were bound for Malaysia swam ashore in southern Thailand after their boat was hit by a storm and drifted off course, the Nation newspaper reported on Thursday. The men, ranging in age from 15 to 40, came ashore on Wednesday morning in Satun, a Muslim-majority province bordering Malaysia, and were taken to a public park where locals provided food and medicine, while police and officials “conducted an inspection”, the report said. The Nation said the men left Myanmar on August 26, and nine days later their food and water ran out. When they saw the coast they swam ashore to survive, and were being “kept at the park, pending further action by Internal Security Operations Command officials,” it said. Tens of thousands of Rohingya have fled Myanmar by sea in the past year, in one of the biggest movements of boat people since the end of the Vietnam War. The number of people boarding boats from Myanmar and neighbouring Bangladesh reached 34,626 from June 2012 to May this year – more than four times the number in the previous year, the Arakan Project says. Almost all were Rohingya Muslims from Myanmar. Their exodus is a sign of Muslim desperation in Buddhist-majority Myanmar, where communal unrest last year in Rakhine state left 192 dead and 140,000 homeless, most of them Rohingya. Rohingya activists put the death toll as high as 748. The authenticity of Syria’s offer to relinquish its chemical weapons arsenal was being tested today as the top envoys of Russia and the US, Sergei Lavrov and John Kerry, held a second day of talks in Geneva aimed at getting the process started. As the Syrian regime formally asked for technical assistance to help it meet the treaty’s obligations, scepticism about its real intentions was deepened by reports that an elite group fiercely loyal to President Bashar al-Assad known as Unit 450 has been dispersing his chemical weapons stockpile to as many as 50 different sites all across the country, just one day after the regime said it would join the Chemical Weapons Convention. This would present new difficulties in both implementing the plan now under discussion in Geneva or, were it to fall apart, launching a US bombing campaign that could be effective. The Syrian ambassador to the United Nations, Bashar Jafaari, said his country was “legally speaking” bound by the Convention by submitting papers to join it on Thursday. Russian President Vladimir Putin welcomed the move. He said last night it was “an important step towards the resolution of the Syrian crisis, this confirms the serious intention of our Syrian partners to follow this path”. However, a statement from the main Western-backed Syrian opposition group, the Syrian National Council, said the regime’s move “comes as too little, too late to save civilians from the regime’s murderous intent”. It said the regime must not be allowed to use diplomacy “to indefinitely stall international action while it continues its policy of widespread violence against civilians”. Syria seemed to be at pains to bolster the credibility of its acceptance of the Russian proposal for it to hand over its arsenal and avoid American strikes. A spokesman for the Office of Prohibition of Chemical Weapons (OPCW) in The Hague confirmed that Syria’s deputy foreign minister, Faisal Mekdad, had contacted it with a request for technical assistance. But there were new warnings in Washington that although it is running with the Russian proposal to rid Syria of its weapons, the US has not taken strikes off the table. UN Secretary General, Ban Ki-Moon, told reporters this evening that a UN inspectors’ report due to be released on Monday will be “overwhelming” in identifying chemical weapon use in the Syrian conflict, which has claimed the lives of more than 100,000 people. He did not say if the regime was responsible for the 21 August attacks nor whether the report would assign blame, which was not part of the inspectors’ remit. But he noted that Assad had “committed many crimes against humanity”. In Geneva, Mr Kerry and Mr Lavrov in principle agreed to resume trying to convene a peace conference involving the regime and the different rebel groups to be dubbed ‘Geneva 2’ and said they would discuss it again on the sidelines of the United Nations General Assembly in 10 days time. Mr Kerry said however that the prospects of a conference “will obviously depend on the capacity to have success here in the next day, hours, days, on the subject of the chemical weapons”.